Sudipto is a Post Graduate in Business Management and a technocrat with 24 years’ experience in the Telecommunications and Electronics industries. Over the years, he had held key positions in technology companies, service providers and Original Design Manufacturers in various capacities - product development, sales / business development, people / team building, commercial and regulatory affairs, manufacturing and after-market services - over his distinguished career. Prior to taking his current position in MROTEK, Sudipto was the Country Director for one of the world’s largest contract manufacturers’ India operations. 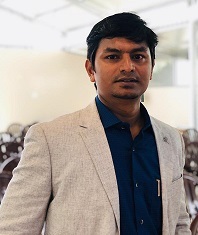 During his career, Sudipto has built successful, profitable businesses several times including his own entrepreneurial stint where he designed and executed complex telecommunication projects. Mr. Srivatsa is a dynamic Chartered Accountant holding the position as Chief Financial Officer, spearheading the finance and accounting function of the Company including legal and compliance matter and is good strategic planner, business analyst and has vast experience in Accounting, SOX Compliance, SOP, Budgeting, MIS, Fund management, Acquisition, Auditing, Working Capital Management, Taxation, Costing, ERP, and Ind AS. Worked in various companies such as Bharat Electronics Limited, ABB, Nilgiris, Renesas and Nagarjuna Group. Mr. Barun Pandey is a dynamic Company Secretary with 1.5 years of experience in a Listed Company. He has completed Bachelor’s degree in Commerce from Gangadhar Meher College, Odisha and is pursuing Master's in Business Law. He has a vast experience in handling the secretarial issues and drafting of various agreements of the Company and has handled IPO of Sri Krishna Constructions (India) Limited, in the year 2015. He is a keen learner and self motivator. If your question has not been answered, you can submit your own by using the form below. Alternatively feel free to Contact us and one of our staff will be happy to assist you.